I've been showing what's in my to go bag a lot on Insta Stories lately and got many questions about my Zero Waste tips on the go. 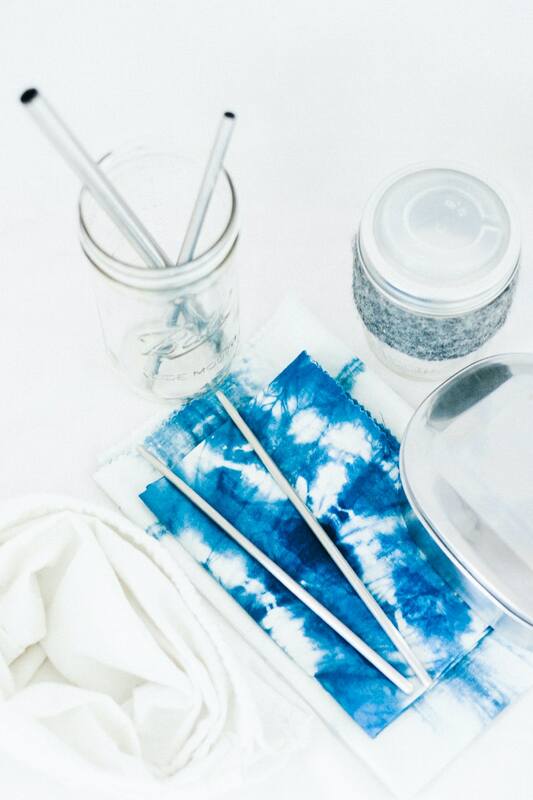 a napkin: you've now seen this one everywhere, I made it during a shibori dyeing class a couple summers ago. I use it as a napkin at restaurants, as a handkerchief, to dry my hands at the restroom, to pack my croissant furoshiki-style at the bakery on Sunday mornings (not at all the same time). a muslin bag: my mother in law sewed a bunch of these for me for Christmas, but the one I use the most is a dust bag I got from a local shop. I bring it to the bakery to put my croissant in, or fill it with trail mix when I go for a hike. stainless steel straws (regular and fat): for juice or bubble tea. stainless steel chopsticks: I got mine for free through my local Buy Nothing chapter. They are pretty heavy but do the job. I take them with me in order to avoid using the non reusable ones wrapped in paper you usually find at sushi restaurants. mason jars: of various sizes, for various uses, from coffee mug to leftovers container. a drink top: to put on my mason jar and drink my chai tea without spilling it. a stainless steel box: to put leftovers in at restaurants. That's a lot of items, but I like to be ready for any scenario. I usually leave the bag in my car and just grab whatever I need before getting off. I guess you can do the same, or, just be a little more organized than I am and plan for the day before leaving on your bike or to take the bus/tram/metro. Also, weight is no issue for me, because I mostly walk short distances or drive. But most of these items can be found in lighter versions (like bamboo or titanium chopsticks). A bamboo utensil kit is also pretty lightweight and durable, I'd recommend starting here. What's one thing you always carry with you to prevent waste? You might also be interested in my Zero Waste Shopping Kit article and 3 Ways to Kickstart your Journey to Less Waste. You can find most on these items mentioned in this post in the Conscious by Chloé Shop.